Today is tutorial day ! I started to seriously use local lights in Second Life. It is really simple to use and is really useful to create an atmosphere in your photos. So here is an simple photo I shooted with my look of the day. How can we create those effects ? 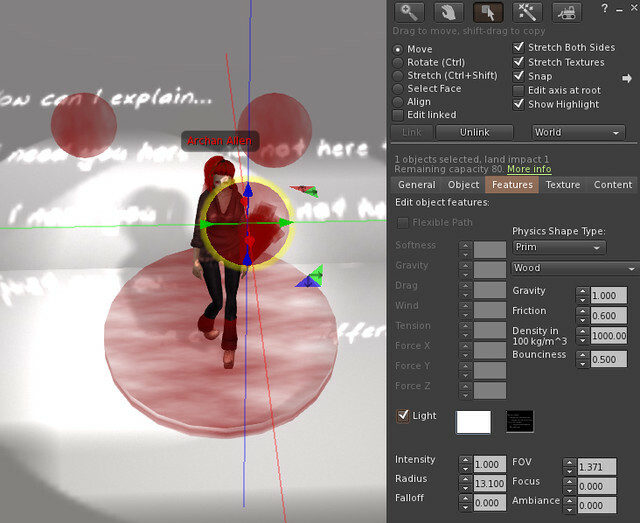 To play with local lights, you need a recent viewer, like Firestorm or Second Life official viewer, with shadows enabled. If you look closely to the photo, you’ll see 2 local lights, like 2 spotlights crossing each other, creating lights on the wall, and your avatar’s shadow. 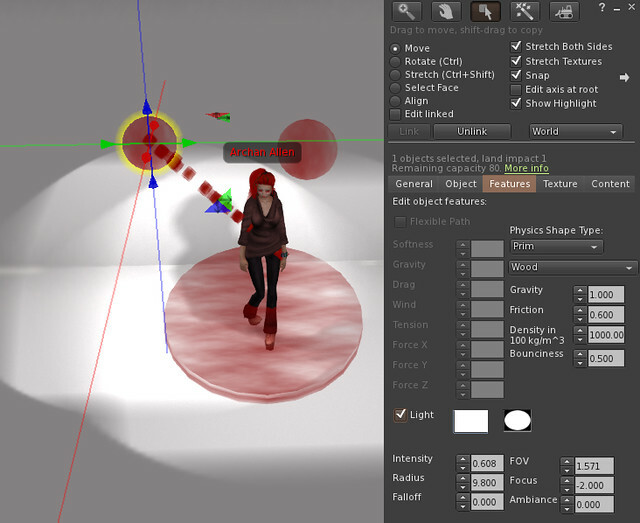 On the screenshot below, you see the spotlights are generated by 2 spherical prims. In the “Features” tab of the editing window, you’ll see the local lights options. Tick the box to activate the feature. Now you can play with the numbers to modify the light’s intensity, to make it blurry, and much more… Also you can play with colors and the textures. YES, textures ! To create a spotlight, I created a white circle inside a black square. Thanks to textured textures (I mean, not plain white texture), you can transform your walls, create the effect of a sun light through a dirty window, things like that. And you can also create a text effect on the walls, and on your avatar, like on the picture below. You just need to write text in white on a black background. See more examples of text effects in my previous blog post, Dear Madame ! The only barrier is your imagination !